Crikey Comments: is fixing the refugee crisis as clear-cut as Ludlam makes out? Want to solve the refugee crisis? Don’t rely on politicians. Crikey readers debate the refugee crisis' supposed "tipping point"
Yesterday, former Greens senator Scott Ludlam wrote on Australia’s refugee issues coming to a tipping point. Crikey readers were divided on the issue: some were wary of false hope, some were wary of the Greens’ positioning, and others were simply wary of the political system. Plus, a reader request. Saugoof writes: I truly hope you’re right, but I’m sceptical. We’ve been at this point before, back in the early 2000’s when a couple of Liberal party MPs around Pedro Georgiou managed to push through some compassion and get kids released from detention centres. That point looked similar to now. Suddenly it seemed like the tide had turned with this motion even having majority popular support. But it really was just a blip on the downward spiral. Ruv Draba writes: The aim of closing Nauru is laudable, but if the Greens seek additional seats to make it happen, I think your first responsibility is now to explain coherently how the Greens see border control working in Australia in a modern context, and present data predicting how many unauthorised boat arrivals are expected, disclose how any expected volume would be processed, vetted and settled, and what this is expected to cost in terms of lives and dollars. I haven’t seen that policy and until you present it, your pitch isn’t credible or even respectful of a discussion that is now well-understood by the Australian people, being seventeen years old. When it comes to border control, Australians don’t just want to punish politicians — they want a safe, sustainable humane solution. So please stop talking down to the Australian people and cherry-picking the moral high ground, and explain precisely what is the Greens’ version of that? Draco Houston writes: Yeah, hats off to all the people who have put their careers on the line inside the immigration system to push this along. As well as the lawyers, medicos, activists, journalists and even clergy who have been immensely helpful. Electoral politics has not really done much, beyond what little the Greens could do. I know there have been some very hard working ALP members (rank and file, not members of parliament) who have been trying to break the bipartisan consensus on torture island prison camps but internal process has been completely unable to do so. Both major parties can only be brought kicking and screaming on this. John Griffiths writes: I’m really surprised (and disappointed) not to have seen anything in Crikey about Simon Birmingham and the whimsical ministerial attack on academic freedom and ARC credibility: unexplained ministerial suppression of $4 million of grants to individual Humanities and Social Sciences researchers. This is a serious matter for intellectual life in Australia. Crikey‘s voice needs to be added to the voices of Vice-Chancellors and sector-based organisations. There needs to be a public outcry lead by people like you. Editor’s note: John, you are absolutely right. This is a subject Crikey should be covering. You’ll be pleased to know we published on this topic today, including an item in Tips and Rumours and a piece of satire from Guy Rundle. Plus we have a couple more pieces in the pipeline. 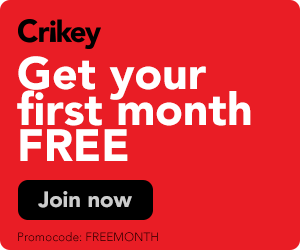 Thank you for your ongoing support of Crikey. We couldn’t do it without readers like you. Grunle’s piece on the ARC was satire? Who can tell with this pack of bigots, halfwits & knuckle draggers?